Pets truly are our best friends, and each day they bring us huge amounts of happiness thanks to their enduring loyalty and companionship. Pets are particularly important for giving us a feeling of wellbeing and studies have shown that the presence of a pet can dramatically improve our quality of life by lowering stress, lowering blood pressure and offering us company that loves to exercise! As our pets get older, it becomes all the more important to ensure that they get the care that they need. But the veterinary costs for an accident or illness can be tough to cover. And, that’s why so many pet owners throughout New Zealand turn to Petplan to provide insurance for seniors pets. Some insurance policies break the bank and can end up costing the owner a great amount of money each month. 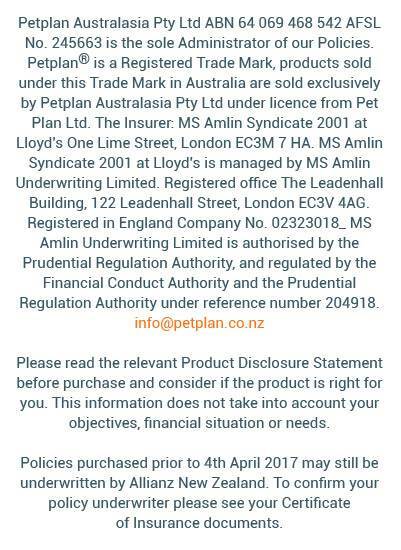 This isn’t a concern for Petplan customers who benefit from our affordable prices for pensioner pet insurance without compromising on quality. It’s easy to get an accurate quote for your pet. You can do this either via our website or by giving one of our helpful representatives a call. The process is simple, and we will ask a series of questions about your pet to determine the cost of your policy. These quotes are free and don’t create any obligation, so there’s nothing to lose! We are sure that you’ll be delighted with our senior pet insurance policies. Many policies might claim to offer lifetime coverage for pets, but you’ll find that this comes with a series of terms and conditions. Our Covered for Life® policies for cats and dogs are the only products available on the market that offer ongoing cover for the lifetime of a pet – as long as there is no break in coverage. Because we only offer pet insurance we are at the top of our niche. Some providers offer all manner of insurances, but this generally lowers the barrier and the level of quality that their customers can expect to find. Pets really do become a member of the family. Of course, you hope that no harm ever comes to them, but it’s important to know that during the good times and the bad you’ll have a policy that can maintain your pet’s health and wellbeing. Our policy covers the cost of unexpected vet bills which helps to handle some of the stress in a trying situation. Depending on the issue these vet bills can run into thousands of dollars, and proper insurance coverage helps to minimize these high costs. You can pursue the highest level of care possible for your furry friend without the fear of a crippling bill coming at the end. Petplan started life in 1976 in the UK and in the decades since it has expanded worldwide. We are one of the largest and most experienced pet insurance providers in the world, and our loyal customers find that they would turn to nobody else. If you would like to get a quote for your pet insurance today, feel free to visit our website and find out more about us.